Viewing gravitational energy-momentum as equal by observation, but different in essence from inertial energymomentum naturally leads to the gauge theory of volume-preserving diffeomorphisms of an inner Minkowski space which can describe gravitation at the classical level. This theory is quantized in the path integral formalism starting with a non-covariant Hamiltonian formulation with unconstrained canonical field variables and a manifestly positive Hamiltonian. 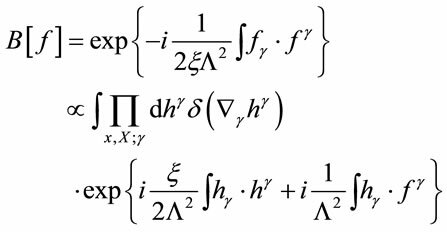 The relevant path integral measure and weight are then brought into a Lorentzand gaugecovariant form allowing to express correlation functions—applying the De Witt-Faddeev-Popov approach—in any meaningful gauge. Next the Feynman rules are developed and the quantum effective action at one loop in a background field approach is renormalized which results in an asymptotically free theory without presence of other fields and in a theory without asymptotic freedom including the Standard Model (SM) fields. Finally the BRST apparatus is developed as preparation for the renormalizability proof to all orders and a sketch of this proof is given. In  we have started to explore the consequences of viewing the gravitational energy-momentum as different by its very nature from the inertial energy-momentum , accepting their observed numerical equality as accidential. As both are conserved this view has led us to look for two different symmetries which through Noether’s theorem generate two different conserved four vectors—one symmetry obviously being space-time translation invariance yielding the conserved inertial energy-momentum vector. To generate an additional conserved four-vector the field concept has proven to be crucial as only fields can carry the necessary inner degrees of freedom to allow for representations of additional inner symmetry groups—in our case an inner translation group yielding the conserved gravitational energy-momentum vector . Gauging this inner translation group has then naturally led to the gauge field theory of volume-preserving diffeomorphisms of , at the classical level, thereby generalizing the Yang-Mills approach for compact Lie groups acting on a finite number of inner field degrees of freedom (also see [2,3] for the mathematical framework). The resulting theory is a consistent classical gauge theory and its gauge fields can be coupled in a universal way to any other field. In , we then have interpreted the theory as a theory of gravitation reducing the full gauge theory of volumepreserving diffeomorphisms of to a gauge theory of its Poincaré subgroup . As a consequence of this reduction we have obtained a relativistic description of gravitational fields interacting with point-particle matter and of matter moving in gravitational fields which —after numerical identification of gravitational and inertial energy-momentum and angular-momentum—in the non-relativistic limit has yielded Newton’s inverse square law for gravity. For the theory’s viability there remains the problem of a consistent quantization. Not only will we have to deal with the usual short distance divergencies of space-time integrals in a perturbation expansion [5,6], but due to the non-compactness of the gauge group we will face additional divergent integrals over inner space which have to be regularized in a way respecting the relevant symmetries (inner Lorentz and scale invariance)—generalizing thereby the finite sums over structure constants appearing in the perturbation series for the Yang-Mills case to the present one. The solution is related to noting that the classical gauge theory of volume-preserving diffeomorphisms of M4 has a linearly realized inner scale invariance which necessarily has to be a symmetry of the quantum effective action as well . This suggests a regularization scheme of the divergent integrals over the gauge group respecting inner scale invariance which will yield a renormalizable quantum field theory uniquely determined up to inner rescalings. Technically we will quantize in the path integral formalism starting with a Hamiltonian formulation of the theory with unconstrained, though neither Lorentznor gauge-covariantly looking canonical field variables and a manifestly positive Hamiltonian. 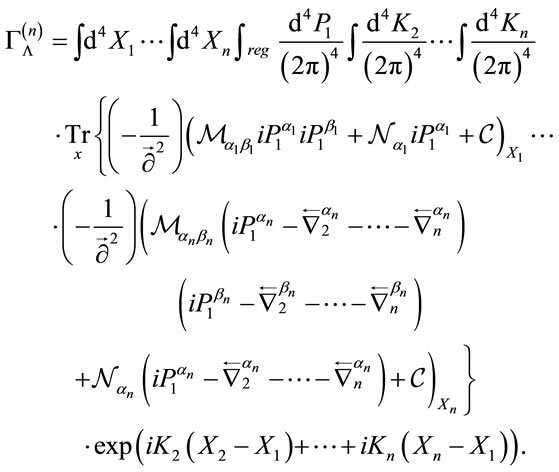 Over various steps the relevant path integral measure and weight are brought into a Lorentzand gauge-covariant form allowing us to express correlation functions first in the Minkowski-plusaxial gauge and applying the De Witt-Faddeev-Popov approach in any meaningful gauge. Next the Feynman rules are developed and the quantum effective action at one loop in a background field approach is renormalized which results in an asymptotically free theory without presence of other fields and in a theory without asymptotic freedom if including the Standard Model (SM) fields. Finally the BRST apparatus is developed as preparation for the renormalizability proof to all orders and a sketch of this proof is given. The notations and conventions used follow closely those of Steven Weinberg in his classic account on the quantum theory of fields [5,6]. They are presented in the Appendix. In this section we quantize the gauge theory of volumepreserving diffeomorphisms of M4 starting with a Hamiltonian formulation of the classical theory equivalent to its Lagrangian formulation in the Minkowski-plus-axial gauge. This allows us to express all quantum amplitudes of interest as path integrals over unconstrained canonical field variables which live in certain functional spaces ensuring the positivity of the Hamiltonian. 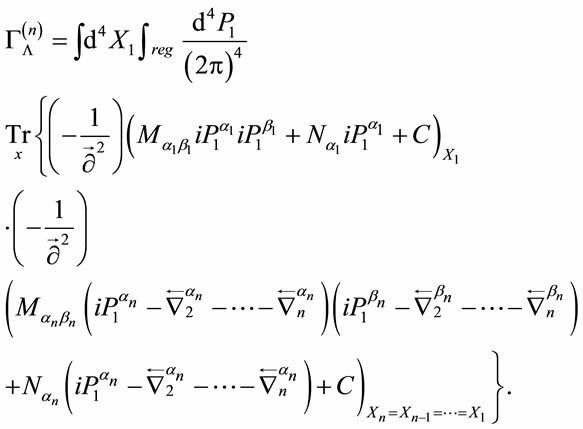 These integrals look neither Lorentznor gauge-invariant. We then show that they can be transformed into explicitly Lorentzand gauge-invariant expressions to be evaluated in the Minkowski-plus-axial gauge resulting in a ghost-free, covariant and unitary quantum field theory with a positive field energy operator. Our starting point is the Hamiltonian formulation of the classical gauge theory of volume-preserving diffeomorphisms of in terms of a minimal set of unconstrained canonical field variables and with a manifestly positive Hamiltonian as developed in . This formulation specifies the physical field content of the theory and comes—after quantization—along with a positivedefinite metric in the Hilbert space of state vectors and a manifestly positive energy operator, hence yielding a viable quantum theory. On the other hand it obscures the Lorentzand gauge invariance embedded in the Lagrangian formulation and comes at the price of non-local relations between the unconstrained field variables and the covariant ones of the Lagrangian formulation. of the independent canonical variables with and also have support on . Their explicit functional form is specified in Equations (18) and (19) below. is a parameter which carries dimension of length ensuring the dimensionlessness of all expressions when counting dimensions w.r.t. inner space. The energy of a field is positive if its support is limited to the forward and backward light cones Equation (2) in inner space—a condition which after expanding the fields into free waves in inner space is equivalent to the more physical one that for all free wave states the square of the gravitational energy-momentum vector K which equals the invariant mass squared is positive. Finally we note that singling out the -field components is a pure matter of convention—we could have as well singled out the - or -field components as will become clear further down. for the unconstrained canonical field variables and , as discussed in . 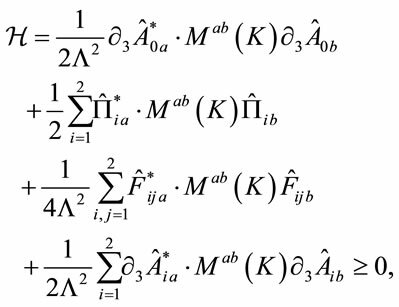 Note that the classical dynamics corresponding to the Poisson brackets above is consistent with the support condition on the fields and that quantization of these Poisson brackets gives us a Hilbert space with positive definite metric for the quantum states. 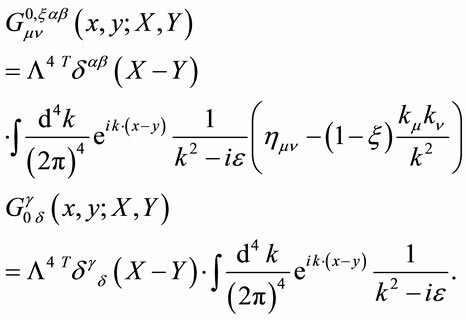 together with a Hamiltonian density for generic “matter” fields with conjugates is our starting point for the path integral quantization. Note that the unconstrained gauge field variables we start with are defined on K-space to manifestly implement the support condition on the fields ensuring a positive Hamiltonian and not on -space on which the “matter” fields are defined from the outset for convenience. Through a series of canonical field transformations and Gaussian integrations we next turn these unconstrained, but neither Lorentznor gauge-covariantly looking path integrals into Lorentzand gauge-covariant ones.
. Here is the Minkowski square. or respectively it becomes obvious that the support for all field components has to be restricted to to ensure positivity of the Hamiltonian. ensures that the fields over -space are real. Note that the support condition on does not translate into a simple condition on which is the reason why we had to start with Fourier-transformed fields to uncover a condition sufficient for the Hamiltonian to be positive. The appropriate functional spaces over which path integrals are to be evaluated are then defined such that their Fourier-transformed elements have support on . which is an additional field defined as a functional of the canonical variables . which is easily proven using Equations (15) and (16). of Equation (1) in terms of the original canonical variables we have used above. which is a Lorentz-invariant expression in inner space. Note that the -functions in the integration measures above do ensure that we integrate over gauge fields and their conjugates belonging to the gauge algebra only.
. Apart from a field-independent normalization factor this is the gauge weight factor Equation (22) with given by Equation (24) in terms of , . and used that is an element of the gauge algebra as is easily verified. are the covariant field strength components . The - terms indicate the appropriate imaginary parts of propagators. Note that the measure Equation (30) is the gaugeinvariant functional measure on the space of gauge fields living in the gauge algebra . Also note that the path integrals are to be evaluated over functional spaces which are defined such that their Fourier-transformed elements have support on . In this section we define the quantum gauge field theory of volume-preserving diffeomorphisms of in general gauges based on the De Witt-Faddeev-Popov (FP) method introducing the ghost fields related to these gauges and the generating functional for Green functions. is field-independent and reduces to an overall normalization factor in the Minkowski-plus-axial gauge. we find that the functional trace of the logarithm of the above Jacobian vanishes—yielding in Equation (39). As a result the gauge field measure is gaugeinvariant and the condition Equation (35) is fulfilled. Now we are in a position to freely change the gauge as path integrals of the form Equation (34) are actually independent of the gauge-fixing functional and depend on the choice of the functional only through an irrelevant constant. The proof of this crucial theorem is found e.g. in —as all the steps in the proof hold true for the gauge theory of volume-preserving diffeomorphisms of as well we do not repeat them explicitly here. where we have introduced the external sources and —transforming as a vector in inner space—for the “matter” and gauge fields respectively. Above we have introduced the ghost fields and which are independent anti-commuting classical variables. The -functions ensure that both sets of variables obey the same constraints as the gauge parameters and that the corresponding operators and are elements of the gauge algebra which proves crucial in defining the BRST-symmetry operation later. What is the condition to represent above as a Gaussian integral as in Equation (43)? on and restricting ourselves to vector-valued functions in which are square-integrable in the sense of the scalar product above the corresponding function space becomes a Hilbert space. For being a selfadjoint endomorphism of with a complete system of orthonormal eigenvectors we indeed have Equation (43) with the -functions automatically taken account of in the Gaussian integration. is the modified FP gauge-fixed action for the gauge theory of volume-preserving diffeomorphisms of . Equation (46) defines the quantum gauge field theory of volume-preserving diffeomorphisms of and is the starting point for the evaluation of matrix elements at the quantum level. 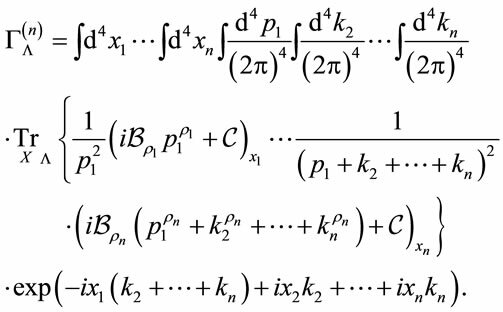 In this section we derive the perturbative expansion of the generating functional for the Green functions of the quantum gauge field theory of volume-preserving diffeomorphisms of M4 and its Feynman rules in Lorentz-covariant Minkowski gauges. We then use power counting to demonstrate the superficial renormalizability of the quantum gauge field theory of volume-preserving diffeomorphisms of M4. Finally we analyze the asymptotic states of the theory and are led to introduce additional quantum numbers related to the inner degrees of freedom of the theory. related to the global coordinate transformation invariance in inner space and generating the self coupling of the gauge fields are elements of the gauge algebra which is easily verified. which is easily shown to be an endomorphism of as required. is the delta function transversal in inner space. The factors of ensure the scale invariance of the r.h.s under inner scale transformations. They are manifestly diagonal and local in inner space and invariant under local inner Poincaré transformations , . Both the fluctuation operators and the propagators are endomorphisms of , i.e. if fulfills so will , and , as is easily verified. In other words the propagators are the inverses of the fluctuation operators on the functional space . As a consequence the - functions in the measure in Equation (50) will be automatically taken care of in the Gaussian integrals above. 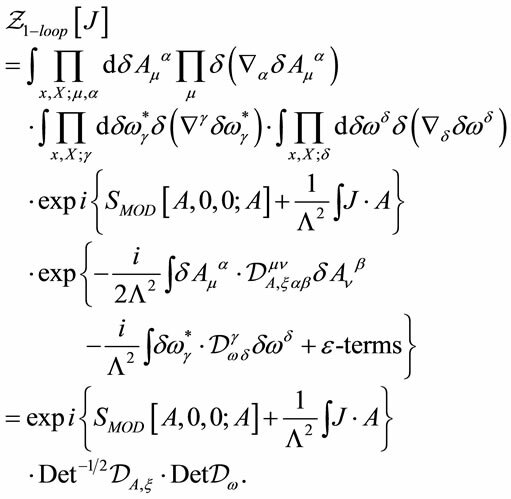 up to the functional determinants of the fluctuation operators Equation (55). These field-independent normalization factors do not contribute to physical amplitudes and can be discarded. Insertion of the result above into Equation (49) gives the unrenormalized perturbation expansion of the generating functional of the Green functions of the quantum gauge field theory of volume-preserving diffeomorphisms of which is plagued by the usual ultraviolet and infrared divergencies of perturbative QFT. On top of these divergencies we will have to deal with potentially divergent integrals over inner space. We will show below that they can be consistently defined respecting the inner scale invariance of the classical theory. 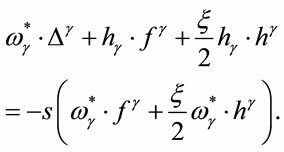 Next we give the momentum space Feynman rules which are easily derived generalizing the usual approach by Fourier-transforming inner space integrals as well. being transversal in inner space. The inner degrees of freedom do not propagate whereas the space-time parts of the propagators equal the well-known Yang-Mills propagators. The particle content is now easily read off—there is an uncountably infinite number of both massless gauge and unphysical ghost fields—the latter to counter-balance the unphysical gauge field degrees of freedom arising in covariant gauges. As the vertices in such graphs contribute polynomials in the inner space coordinates to the integrand and as these inner degrees of freedom do not propagate such integrals look badly divergent—we will show in the next section that they can be consistently defined respecting the inner scale invariance of the classical theory. and relevant for power counting as their Yang-Mills counterparts do. where is the number of gauge field and ghost lines and the number of space-time derivatives attached to the respective vertex. which shows that only a finite number of combinations of external lines will yield divergent integrals. As a result the quantum gauge field theory of volume-preserving diffeomorphisms of is renormalizable by power counting. Let us finally consider the classification of asymptotic one-particle states assuming they are not confined which will be further analyzed in the next section. To label the physical state-vectors we construct a basis of the one-particle Hilbert space of the gauge field theory of volume-preserving diffeomorphisms of given by simultaneous eigenvectors of observables commuting amongst themselves as well as with the Hamiltonian of the theory. In other words we look for a complete system of conserved, commuting observables. The specific difference of the present theory to a YangMills theory arises from the structure of the gauge group —all observables not related to the gauge group remain the same and comprise the energy, the momentum and angular momentum three-vectors and other conserved internal degrees of freedom . As the quantum gauge field theory of volume-preserving diffeomorphisms of and minimally coupled “matter” field Lagrangians are translation and rotation invariant in inner space we have the additional conserved observables—the gravitational energy-momentum operator and the gravitational angular momentum tensor. As commutes with the already identified set of observables including the Hamiltonian (consistent with the Coleman-Mandula theorem) its eigenvalues become additional quantum numbers labelling physical states. In addition, as all “matter” fields transform as scalars and the gauge and ghost fields as vectors under inner Lorentz transformations inner spin becomes yet another quantum number. labeled by the momentum four-vector , the spin , the gravitational energy-momentum vector and the inner spin which is for “matter” and for the gauge and ghost fields of the gauge field theory of volume-preserving diffeomorphisms of . 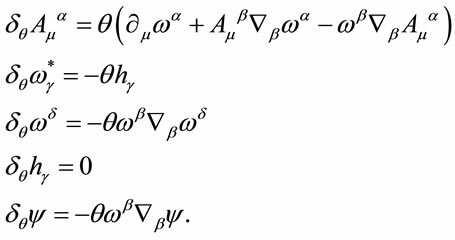 The relation of these state vectors to asymptotic states describing observable particles with gravitational equal to inertial energy-momentum and the definition of the -matrix is developed in detail in . In this section starting from the formal perturbative expansion derived in the last section we calculate the renormalized effective action at one loop. The crucial point is to note that space-time and inner space integrals in the calculation of loop graphs completely decouple which allows us to first regularize the potentially divergent inner space integrals appropriately. Note that any consistent definition must respect the inner scale invariance of the classical action at the quantum level as this linearly realized symmetry is a symmetry of the quantum effective action as well . This allows us second to deal in the usual way with the ultraviolet divergencies related to the short distance behaviour in space-time and demonstrate the renormalizability of the gauge field theory of volume-preserving diffeomorphisms of at one loop. Technically we derive a formal expression for the oneloop effective action of the quantum gauge field theory of volume-preserving diffeomorphisms of working in a covariant Minkowski background field gauge. We then define the inner momentum integrals using as a cut-off and demonstrate the locality of the one-loop effective action in inner space. To prove the renormalizability at one loop we calculate the divergent contributions to the functional determinant of a general fluctuation operator with differential operator-valued coefficients in four space-time dimensions. Finally we determine the one-loop counterterms, renormalize the oneloop effective action and calculate the -function of both the pure quantum gauge field theory of volumepreserving diffeomorphisms of and the same theory minimally coupled to the Standard Model fields. is the covariant derivative in the presence of a background field we will further specify below. determines B as a functional of J at least perturbatively. They are endomorphisms of , i.e. if fulfills so will and , as is easily verified. Note that we had to commute with to get the expression above for . 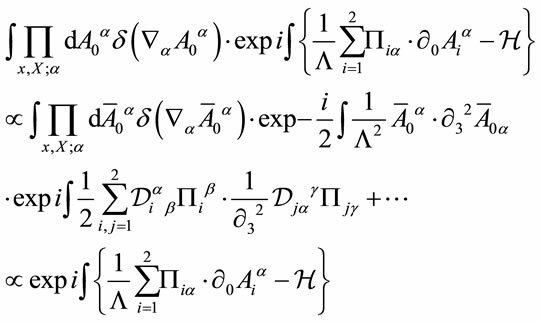 As the fluctuation operators are endomorphisms of the integrals in Equation (82) are Gaussian and can be performed resulting in the usual determinants. 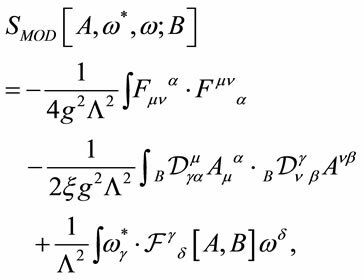 Indeed, endowed with the scalar product Equation (45), becomes a Hilbert space with a complete orthonormal set of eigenvectors for each of the selfadjoint fluctuation operators above. These bases of the Hilbert space take the -functions automatically into account and the integration over each eigenvector direction becomes Gaussian. which is the formal expression for the one-loop effective action we were looking for. 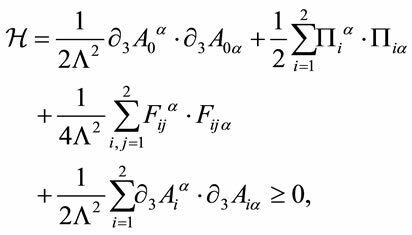 From now on we work with the specific choice and drop the subscript to keep the calculations below as simple as possible. To get a well-defined quantum theory at the one-loop level we have to show that the functional traces in Equation (85) above evaluated over inner space can be appropriately defined, an issue which does not arise in YangMills theories of compact Lie groups due to the finite volume of the underlying gauge groups. where are both matrices in inner space and matrix-valued differential operators in Minkowski space. This form is quite general and can account for covariant Minkowski background-field gauges such as in Equation (74) as well, however, for the operator would take an even more general form. it becomes obvious that the definition of the -integrals above over polynomials in requires care in order to avoid potential infinities related to the non-compactness of the gauge group. Note that this regularization respects the inner scale invariance. To write it in a Lorentz-covariant way we have used the fact that there is always a Lorentz frame with a time-like vector which has as its invariant length so that in this frame. The expression above for is not only finite as an integral over inner space, but also local in . 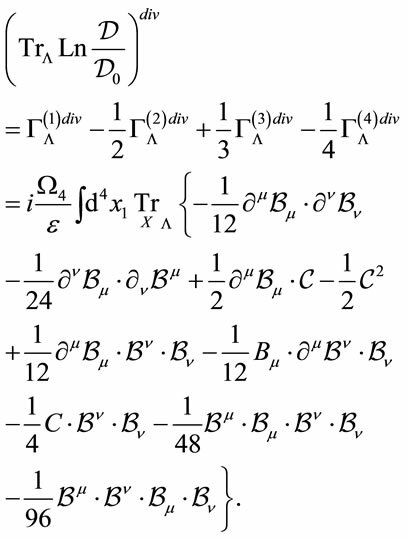 Note that the regularized integrals over collapse into sums over products of metric tensors in inner space and factors of to some power ensuring the correct dimension in inner space. These sums correspond to the sums over structure constants in the Yang-Mills case. respecting the scale invariance of the classical theory as they have to because this invariance is linearly realized and hence an invariance of the quantum effective action as well . At one loop the dependence of the theory on is again controlled by its scale invariance. In other words up to one loop theories for different are equivalent up to inner rescalings. This symmetry is not distroyed by the renormalization required for the divergent space-time integrals with which we deal in the next subsection for the simple fact that both types of integrals and how we properly define them completely decouple. 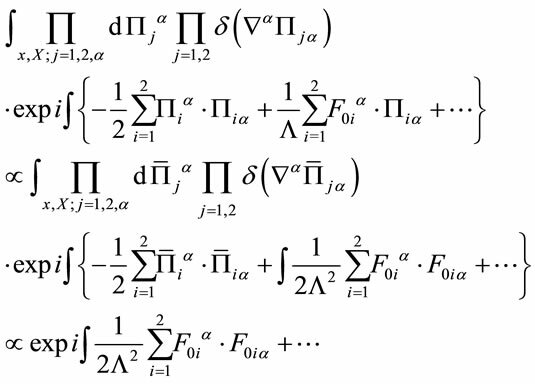 We turn to calculate the divergent contributions to the functional determinant of a general fluctuation operator with differential operator-valued coefficients in four spacetime dimensions in preparation of the one-loop renormalization in the next subsection. where are both matrices in Minkowski space and matrix-valued differential operators in inner space. Again, this form is general enough to cope with covariant Minkowski background-field gauges such as in Equation (74), however, the case is not included. and where . Note the occurrence of the propagators above which is in marked difference to the local inner space integrals analyzed in the last subsection. 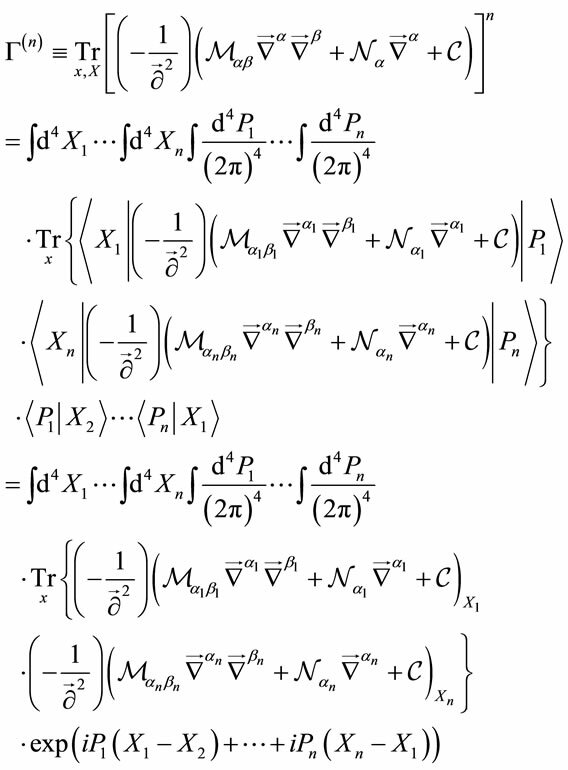 Now it is easy to read off the degrees of divergence for the -integrals which are bound by . Hence, only the for have a divergent contribution. which belongs to the gauge field operator . With the formulae Equations (103) and (104) which hold true for general fields living on both space-time and inner space we are now in a position to analyze the one-loop renormalizability of the quantum gauge field theory of volume-preserving diffeomorphisms of both in the absence and presence of “matter” fields. Note that after properly regularizing the inner space integrals we can safely interchange the order of taking the traces over inner space versus space-time variables if needed. In this section we perform the functional trace over space-time variables first. Note that as for other gauge field theories it is the second term in Equation (106) which determines the sign of the gauge field contribution above—which will in turn determine the sign of the β-function of the quantum gauge field theory of volume-preserving diffeomorphisms of M4. where as calculated in . The oneloop divergence is proportional to the original action of the gauge field theory of volume-preserving diffeomorphisms of and the theory is renormalizable at one loop. 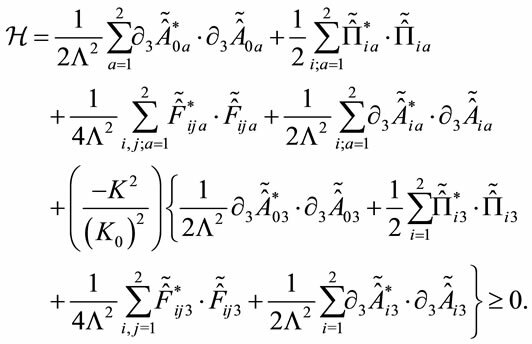 Note the formal similarity of the formula above with the analogous expression for Yang-Mills theories, especially the occurrence of the universal numerical factor . As a result the one-loop effective action after regularization of the inner space integrals and renormalization is a perfectly well defined expression. and the theory is asymptotically free. Note that does not get renormalized as we would expect from the complete decoupling of inner and spacetime integrals and their treatments. As discussed in  the fields of the gauge theory of volume-preserving diffeomorphisms of M4 interact with all fundamental fields appearing in a QFT such as the SM of elementary particle physics through minimal coupling. 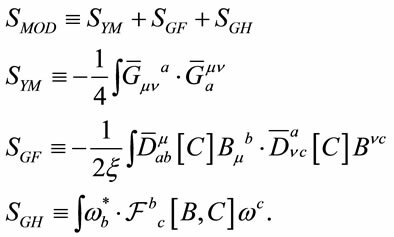 For clarity we call all these other fundamental scalar, spinor and (gauge) vector fields “matter” fields in the sequel. For a potential physical interpretation of the gauge field theory of volume-preserving diffeomorphisms of M4 it is thence crucial to extend the analysis of the asymptotic scaling behaviour above to include the impact of these other fields on the renormalized coupling and the -function. To be specific let us do this analysis for the SM fields which we mini-mally couple to the gauge field theory of volume-preserving diffeomorphisms by (1) allowing all SM fields to live on (with possibly the same restriction for the support of inner space Fourier-transformed “matter” fields to )—adding the necessary additional inner degrees of freedom—and by (2) replacing ordinary derivatives through covariant ones in all “matter” Lagrangians as usual. In Appendix A we have derived the additional divergent contributions to the one-loop effective action contributing to the renormalization of the gauge field theory of volume-preserving diffeomorphisms of . To apply this to the SM let us recall its field content. The SM is built by gauging which leaves us with 8 strongly, 3 weakly and 1 electromagnetically interacting gauge fields—12 in total. These fields interact with 3 families of leptons and quarks, two of which are structural replications of the first family consisting of the 15 chiral Dirac fields for , where indicates the strongly interacting color degrees of freedom. Finally there is a Higgs dublett adding two scalar degrees of freedom. 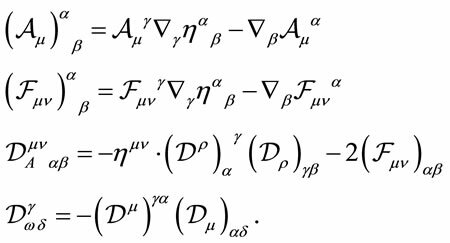 of the gauge field theory of volume-preserving diffeomorphisms of M4 minimally coupled to the Standard Model fields. The combined theory is not asymptotically free and we expect the inner space degrees of freedom and the gauge and “matter” fields associated with them to be observable and asymptotic free field states to exist which we have discussed in detail in . In this case it also makes sense to evaluate the classical limit of the gauge field theory of volume-preserving diffeomorphisms of as we have done in  deriving Newton’s inverse square law of gravitation. 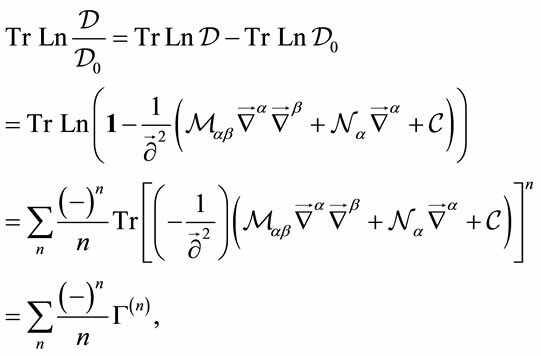 In this section, we introduce the nilpotent BRST transformations for the gauge field theory of volume-preserving diffeomorphisms of M4 and establish the BRST invariance of the gauge-fixed action. 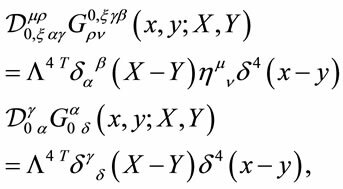 We define the physical states as equivalence classes of states in the kernel of the nilpotent BRST operator Q modulo the image of Q. Finally we discuss the generalized BRST quantization of the gauge field theory of volume-preserving diffeomorphisms of M4. Green functions are now given as path integrals over the fields , , , , with weight . The extension to products of polynomials in these fields follows then easily. As for Yang-Mills theories Equation (128) shows that the physical content of the gauge field theory of volumepreserving diffeomorphisms of is contained in the kernel of the BRST transformation modulo terms in its image. 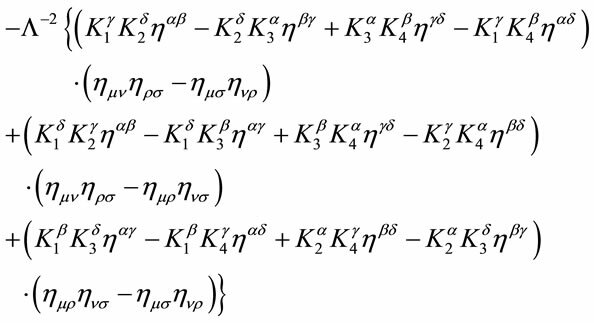 Independent physical states are defined as the equivalence classes of states in the kernel of modulo the image of . with being a general functional respecting the restrictions above. -matrix elements of physical states annihilated by the appropriate BRST operator of the theory are then independent of . In addition, in the Minkowski-plusaxial gauge the ghosts decouple in the quantum gauge field theory of volume-preserving diffeomorphisms of , hence they decouple for any choice of and the theory is ghost-free. In this section we sketch a proof of the renormalizability of the gauge field theory of volume-preserving diffeomorphisms of M4 to all orders. A general proof of the renormalizability of the gauge field theory of volume-preserving diffeomorphisms of , i.e. the existence of a finite, well-defined perturbative effective action, has to comprise the analysis of the divergence structure and the renormalizability of space-time integrals as for Yang-Mills theories and in addition the verification that inner space integrals can be properly regularized respecting the scale invariance of the classical theory which is a key condition as this is a linearly realized classical symmetry which extends necessarily to the quantum effective action. Turning to the first point we note that we should be able to employ the full machinery developed for the inductive proof of renormalizability for Yang-Mills gauge theories as the general structure of the quantum gauge field theory of volume-preserving diffeomorphisms of M4 formally is close to that of quantum Yang-Mills theories. 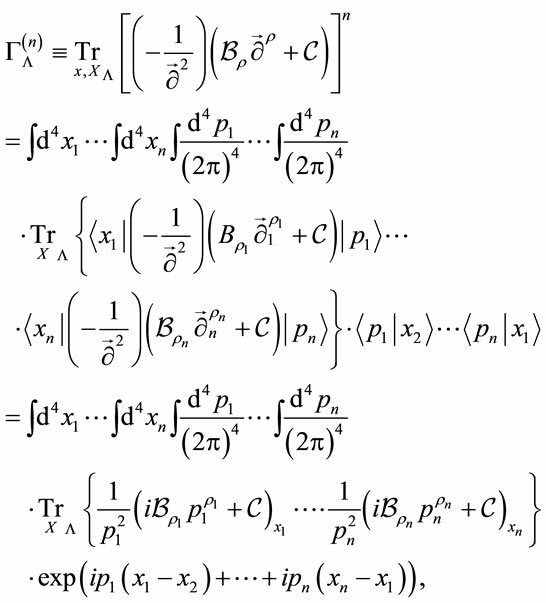 Hence we should be able to repeat all the steps in the renormalizability proof e.g. given in the Chapters 15 to 17 in  or in . The only change arises from the slightly different form of the BRST transformations for the gauge field theory of volume-preserving diffeomorphisms of M4 as compared to Yang-Mills gauge theories requiring the adaptation of the analysis given in Section 17.2 of . ensuring consistency and the uniqueness of the theory up to inner rescalings. noting that the inner scale invariance is a linearly realized symmetry of the gauge field theory of volumepreserving diffeomorphisms of and hence a symmetry of the quantum effective action . This ensures the uniqueness of the theory up to inner rescalings at loops. The locality of the theory in inner space for any number of loops follows from the non-propagation of inner degrees of freedom which can be most easily read off the propagators in Equatios (60). This completes the sketch of a general proof of the renormalizability and the essential uniqueness of the quantum gauge field theory of volume-preserving diffeomorphisms of . In this paper, we have quantized the classical gauge theory of volume-preserving diffeomorphisms of in the path integral formalism starting with a Hamiltonian formulation of the theory with unconstrained, though neither Lorentznor gauge-covariantly looking canonical field variables and a manifestly positive Hamiltonian. As the canonical field variables obey the usual Poisson brackets the physical Hilbert space of states has positive norm and is ghost-free. 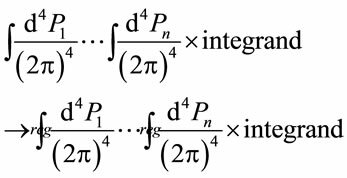 Over various steps we then have brought the relevant path integral measure and weight into a Lorentzand gauge-covariant form allowing us to express correlation functions first in the Minkowski-plus-axial gauge and— applying the De Witt-Faddeev-Popov approach—in any meaningful gauge. On that basis we have developed the Feynman rules of the theory and demonstrated that the gauge theory of volume-preserving diffeomorphisms of is renormalizable by power-counting. Finally we have discussed the new quantum numbers appearing in the theory which label state vectors. Next we have calculated and renormalized the divergent parts of the quantum effective action at one loop in a background field approach. Here we had to deal not only with the usual short distance divergencies of space-time integrals in a perturbation expansion [5,6], but due to the non-compactness of the gauge group, also with additional divergent integrals over inner space. We have regularized these based on the requirement of respecting the relevant inner symmetries (inner Lorentz and most importantly inner scale invariance)—generalizing thereby the finite sums over structure constants appearing in the perturbation series for the Yang-Mills case to the present one. 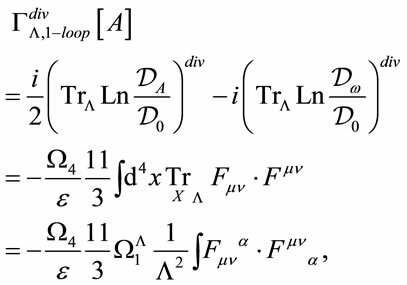 The result at one loop is a negative -function and hence an asymptotically free theory without the presence of other fields and a positive -function and a theory without asymptotic freedom after minimally coupling the Standard Model (SM) fields to the gauge fields. Finally we have developed the BRST apparatus as preparation for the renormalizability proof to all orders and given a sketch of this proof which in itself is one of the open points to be further addressed. Yet we have demonstrated that the gauge theory of volume-preserving diffeomorphisms of is a quantum field theory fulfilling the key requirements towards a physical theory: namely to have a positive Hamiltonian, a ghost free Hilbert space of states with positive norm and a unitary S-matrix. Taking this into account together with the demonstration that the theory at the classical level yields a relativistic description of gravitation we propose the gauge theory of volume-preserving diffeomorphisms of as a viable candidate for a renormalizable quantum theory of gravity. On top, none of the well-known fundamental difficulties such as the disappearance of the notion of a particle or the non-existence of non-trivial correlators arising in the attempts to quantize General Relativity or any other geometric theory of gravity [9,10] plagues the current approach as all the notions developed in the context of a relativistic QFT can immediately be generalized to our context. Also let us point to interesting not yet analysed questions such as to the structure of the vacuum of the present theory—noting that unlike in the Yang-Mills case, where implies that is pure gauge, in our case also results from any —or to the perturbative calculation of correlation functions and scattering cross-sections which in the gravitational scattering of matter should result in the non-relativistic limit in well-known Rutherford-type formulae  allowing for further consistency checks. Finally what makes the gauge theory of volumepreserving diffeomorphisms of an attractive candidate for a consistent classical and quantum theory of gravity in the first place is its structural analogy with the existing gauge field theories of the electromagnetic, weak and strong interactions [12-14]. If it was the “right” theory we would finally have a unified view of Nature and a consistent framework to describe all fundamental interactions at all accessible scales and without any logical or mathematical rift between the worlds of classical and quantum physics. C. Wiesendanger, “I—Conservation of Gravitational Energy Momentum and Inner Diffeomorphism Group Gauge Invariance,” arXiv:1102.5486 [math-ph]. J. Zinn-Justin, “Quantum Field Theory and Critical Phenomena,” Oxford University Press, Oxford, 1993. C. Itzykson and J.-B. Zuber, “Quantum Field Theory,” McGraw-Hill, Singapore City, 1985. S. Pokorski, “Gauge Field Theories,” Cambridge University Press, Cambridge, 1987. T.-P. Cheng and L.-F. Li, “Gauge Theory of Elementary Particle Physics,” Oxford University Press, Oxford, 1984. 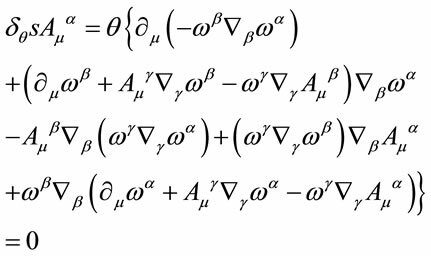 In this Appendix, we calculate the divergent vacuum contribution of a gauge vector field, a Dirac spinor and a complex scalar doublet to the one-loop effective action of the gauge field theory of volume-preserving diffeomorphisms of . The bars over derivatives etc. indicate minimal coupling to the gauge field theory of volume-preserving diffeomorphisms of . where we have discarded the factor which accounts for the number of independent gauge fields. Note that such a term will reinforce asymptotic freedom. Note in addition that this formula also holds in the Abelian case where the ghost contribution in the presence of does not reduce to a field-independent determinant. is the spinor action coupled to a Yang-Mills field through the covariant derivative . Here is the generator of the gauge algebra in the fermion space. Note that this will work against asymptotic freedom. Note in addition that a chiral Dirac field contributes just half of the value above. is the doublet coupled to the gauge bosons of the electro-weak interaction through the covariant derivative . which holds independent of whether the Higgs mechanism is in place or not and will work against asymptotic freedom. Note that a single complex scalar field contributes just half of the value above. Generally, (M4, η) denotes the four-dimensional Minkowski space with metric , small letters denote space-time coordinates and parameters and capital letters denote coordinates and parameters in inner space. Specifically, denote Cartesian spacetime coordinates. The small Greek indices from the middle of the Greek alphabet run over . They are raised and lowered with , i.e. etc. and transform covariantly w.r.t. the Lorentz group . Partial differentiation w.r.t to is denoted by . Small Latin indices generally run over the three spatial coordinates . from the beginning of the Greek alphabet run again over . They are raised and lowered with , i.e. etc. and transform as vector indices w.r.t. . Partial differentiation w.r.t to is denoted by .